Beagle, also known as Bagle is a large family of email worms with many variations. Beagle is notable for the fact that many variants came in password-protected .zip files, with the password usually contained in the body of the message. Beagle arrives in an email with a spoofed sender line. The alleged sender has an email address with the same domain name as the recipient. The subject of the mail is "Hi" and the message is "Test =)" followed by a string of random characters with "Test, yep." at the end. The attachment name is a string of random letters with a .exe file extension and the icon often looks like the Windows calculator. After execution, some variants of Beagle will check the system date and may not do anything if the date has gone beyond a certain point (2004.01.28 for Beagle.A). If the date on the infected computer is wrong and displays a date before the time the worm is supposed to stop running, it will run and continue to spread from that computer. The worm creates a listening thread on the TCP port 6777. If a cracker sends a specially formatted message to the worm through this port, the worm will allow an arbitrary file to be downloaded to the Windows system folder. Beagle also creates a thread that notifies a number of website of the presence of the worm every ten minutes. The creator of the original Beagle is unknown, but one researcher points to Caesar2k of the group Nuclear Winter Crew, as his creation Titog was similar in that it shut down the same processes as the M variant of Beagle. Also, Caesar2k and other members of the group code in Delphi, the language Beagle was coded in. 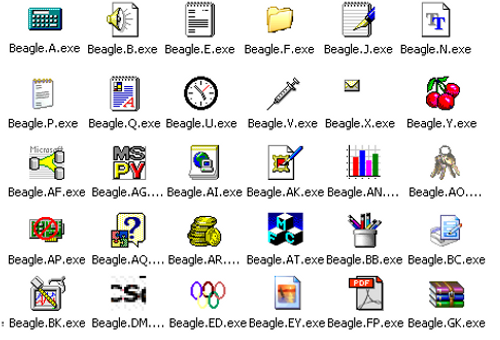 Beagle gets its name from the file bbeagle.exe, which is the file name of the original and some subsequent variants of the Beagle worm drop into the system folder. It also goes by the name Bagle, as antivirus companies try to avoid using the name that the virus coder intended. There are enough variants of Beagle to go through the alphabet several times, and they go up to at least Beagle.GM. Typically they are around 20,000 bytes in length, but some go below 10,000 while others are well above 100,000 bytes. The Beagle.P variant (may have a different letter with different antivirus scanners) as well as a few others can infect computers without an attachment file in its email. It contains an ActiveX control that creates and runs a VBScript on the system, which downloads and executes the worm from one of a list of IP addresses.